Hixson United Methodist Church is partnering with Hixson Middle School, Northside Neighborhood House, Helen Ross McNabb Centers and The Family Justice Center to host a seminar to discuss teenage internet safety, technology addiction, social media, cyberbullying, sexting and other topics. “We guarantee you will leave this event with specific steps you and your family can take to safeguard your home and children's lives,” organizers said. "How young people use technology is creating more teenage anxiety, depression, isolation and addiction than ever before. Parents today struggle enough with engaging their child in 'real life,' not to mention keeping up with them in the digital world. How can parents and families be prepared to deal with this hidden challenge?" 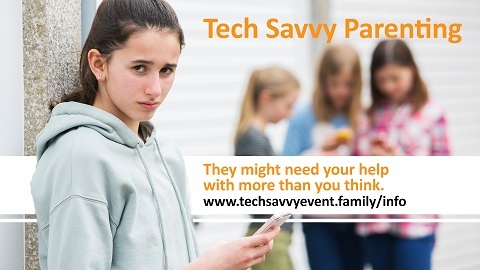 This evening seminar entitled "Becoming a Tech Savvy Parent" is for parents of middle and high school students. The program will be held on Monday, Oct. 22 at Hixson Middle School Gymnasium beginning at 6 p.m. Dinner will be provided by Northside Neighborhood House at 5:30 p.m., and is available with pre-registration here. Speaker Brian Housman, of 360Family, offers encouragement and coaching as parents take on the intimidating process of understanding their teenage student’s digital world, officials said. 360Family is a Memphis-based non-profit organization that provides support and training for parents, teachers and churches. For more information on this upcoming event, contact Hixson United Methodist Church Student Ministry Office at 423-877-1246.